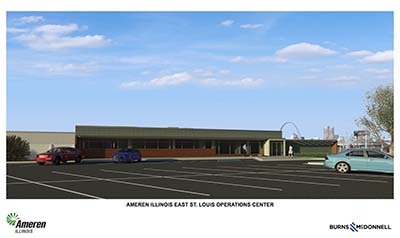 Ameren Illinois announced plans today to renovate its main East St. Louis operating center. The facility, located at 500 East Broadway, was originally constructed in 1959 and in need of updating. The $9 million project will begin in May of 2017 and will be completed by the end of 2017. “This facility will provide a more modern work space for our current employees and support our efforts to attract the next generation of workers to the region," said Richard J. Mark, president of Ameren Illinois. "We have had a strong presence in East St. Louis for many years and we're excited to make this investment and solidify the community as a key hub in our efforts to build a smarter, more reliable grid." Ameren Illinois employees will work at the facility when completed, with room for additional expansion. “This is an ideal location that provides us with easy access to major thoroughfares to reach our customers in a timely and safe manner," Mark said. Renovations will include a complete overhaul of the exterior and re-building of the offices and crew areas to comply with current building code standards. The front parking lot will be re-configured and new fencing and security gate will be added. The current truck shelter will be repainted and will receive lighting and security upgrades. Ameren has a goal of awarding 30-percent of the construction budget to diverse businesses. The overall project is expected to create more than 50 construction jobs. "It's a great opportunity to support the local trades and support the East St. Louis economy," Mark added. to power the quality of life. Our service territory covers more than 1,200 communities and 43,700 square miles. For more information, visit AmerenIllinois.com, find us on Twitter @AmerenIllinois or Facebook.